Any new album by Neil Young is welcome. But some are more welcome than others. Fork In The Road had the door slammed in its face. Storytone wiped its feet, but wasn’t allowed to stay. Psychedelic Pill was found a quiet place in a corner to sit down and recover. In fact, Chrome Dreams II was the last to be let into the drawing room for a nice cup of tea in the best china. For its part, The Monsanto Years is one of those Neil Young albums that you greet with the door only slightly ajar and the safety chain still firmly on. Like Greendale, it’s not entirely clear whether or not it’s safe to let it in. Well, after sizing it up for a while, the decision has finally been made. Come on in The Monsanto Years. You’re very welcome. Why? Well, partly because there’s a real Crazy Horse vibe at times. True, there are never enough riffs to get Ragged Glory lost in, but the rhythm section is great and there’s some fine guitar work and not just from the frets of Old Black. Plus, there are some memorable songs. ‘A New Day For Love’ wouldn’t be out of place on Broken Arrow, that most maligned of Crazy Horse albums. ‘Wolf Moon’ has clear and present Harvest Moon echoes. And the frazzled country sounds of American Stars ‘n’ Bars can be made out on some of the tracks, not least ‘A Rock Star Bucks A Coffee Shop’. But the centrepiece is ‘Big Box’. This is one of Neil’s story-telling tracks, reminiscent of ‘Crime In The City’, or ‘Ordinary People’. It’s utterly effervescent, keeping up a breathtaking pace until the very end. Too often recently, Neil Young albums have got lost in the very idea alone. A Letter Home with the Voice-o-Graph. Storytone with the orchestra and big band. The Monsanto Years could have gone the same way. But the song-writing and the playing keep it more than honest. Credit to Neil Young. Credit to Promise of the Real. Here’s Haskell Wexler’s documentary that captures the making of the album. It’s quirky. Worth it. 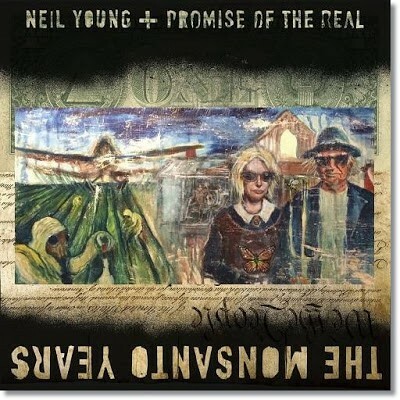 Posted in Neil Young, Neil Young + Promise Of The Real and tagged as Music, Neil Young, Neil Young + Promise Of The Real, Review.